As frightening as the “The Nun” is, it doesn't hold a candle to today's real-life horrors in the Catholic Church. But while a new generation of filmmakers has breathed new life into horror by embedding it with frightful and salient social commentary, the “The Conjuring” franchise – of which “The Nun” is a spinoff and the fifth installment – isn't about anything so real. It's about exhuming classic horror archetypes – creaky old houses and creepy old dolls – with (mostly) old-school effects. And what's more old school than a mean ol' nun? Set in 1952, “The Nun” is the origin story of Valak (Bonnie Aarons), a demonic nun who first turned up in “Conjuring 2,” as the pursuit of Vera Farmiga's paranormal expert. This time, our protagonist is Sister Irene (played by Vera's younger sister Taissa Farmiga), a novitiate who, just before her vows, is dispatched by the Vatican, along with Father Burke (Demian Bichir), an expert in unexplained phenomena (or as he says, “miracle hunting”), to a remote Romanian abbey where a young nun has just hung herself. The decaying, overgrown abbey and its adjoining covenant are suitably eerie. The place, handsomely crafted by production designer Jennifer Spence, has the feel of a horror-movie set, complete with a foggy cemetery, and the action that follows has the almost comforting pattern of surprises and scares that's to be expected. Entering the gothic world of “The Nun,” built so sturdily on horror movie clichés, is to slide into a darkly fantastical realm that's practically cozy it's so familiar. But what distinguishes “The Nun” is its silky, sumptuous shadows. 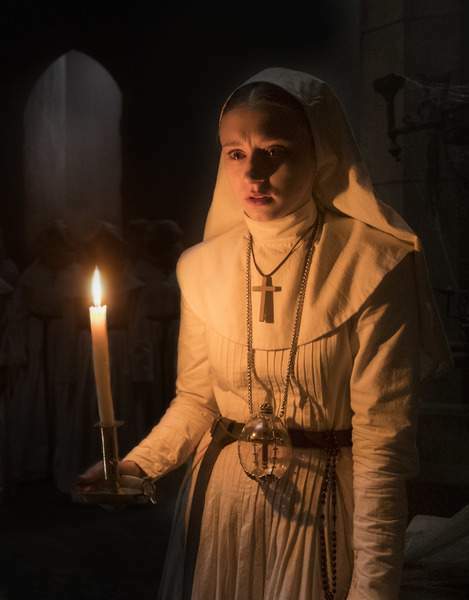 Directed by British filmmaker Corin Hardy (”The Hallows”) and shot by Maxime Alexander (who was also cinematographer on the “Conjuring” spinoff “Annabelle: Creation,” “The Nun” shrouds itself so much in darkness that it at times verges on becoming a nightmarish abstraction. You almost lose sense of what exactly is going on, as Sister Irene falls into a labyrinthine abyss.